The Blue Note harkens back to the early days of jazz, when experiencing and sharing the polyrhythms and strains of improvisation were meant to be intimate. It's an old, but fair sized jazz club, with an elegantly simple sign hanging over an equally elegant yet simple door of midnight blue decorated with sparkling silver quarter notes. Stepping inside is like stepping back into those earlier, more classical times. 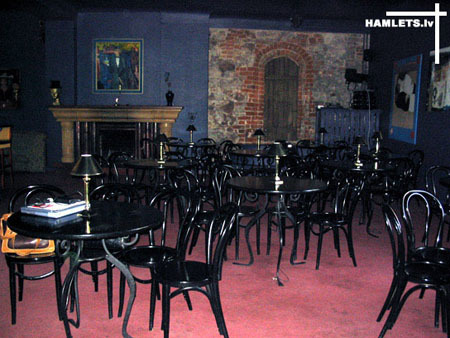 The walls are dark blue and decorated with black and white and color photographs of the jazz and blues greats who've either played the club or visited back in their hey day. Interspersed with that are colorful posters of past (some framed and well preserved) and upcoming events and entertainers. The color of the wood inside, and there's plenty of it from the trim, to the booths, to the bar to the high beams and the tables, matches the dark colored walls. The wood is a teak, stained to black, time worn with history but not care worn. Directly across from the main entrance is a short stage made of the same dark wood, then painted over black and tiled in ceramic tile of black, swirled through with white and blue, almost reminiscent of marbling. The centerpiece of the stage is the grand piano, but there's more than enough room for a band to set up around the piano. A few steps lead up to the stage which is lit by a spotlight and sometimes smaller lights of pale blue or red. The bar is situated against the right wall, and the front wall and left wall are dominated by eight booths. Three on the front wall, five on the left wall, each with a small step up granting access to the booth. In the floor area between, small cafe style tables with two to four chairs have been set up. The centerpieces of each table are blue, red, or gold glass globes holding a single votive candle for a bit of mood lighting at the tables. Aside from the spotlights on the stage and the lighting around the bar, the lights are dim to enhance the feeling of intimacy in the atmosphere of the club.